Whether you preach from a pulpit or sit in a pew, you hope (and pray) for a homily that connects the Good News with life. But what does it mean to connect? In a world that buzzes with the synapses of technological "connection," can the human touch of preaching make a difference anymore? Why does Sunday preaching matter and to whom? Why is Catholic preaching such an uphill climb? How can we connect the Gospel message with our young people? What are the struggles of clergy-on-the-ground in preaching? What is going on in the listener's head during the homily? And finally, what can each of us do to help "connection" in preaching become more common? New research speaks to those questions from the voices of youth, the experiences of lay leaders, and the words of priests and deacons. Karla Bellinger offers concrete ways to connect the pulpit and the pew so that preaching becomes an act of love within a community of caring. This practical book breaks open an important and necessary conversation. Karla J. Bellinger, MA, DMin, is Associate Director of the John S. Marten Program for Homiletics and Liturgics at the University of Notre Dame. The core of the new evangelization-what is heard and not simply what is proclaimed-informs the central thesis of Connecting Pulpit and Pew. Written in an accessible and practical style, this book invites the homilist to enter the world of the listener and explore ways to be heard better through constructive dialogue, which is so important and yet rarely pursued. This study will assist all in the Church as we answer the call of Pope Francis to make good preaching a true encounter with Jesus Christ and a vital part of the new evangelization. This timely and important book helps frame one of the critical questions for the Catholic church trying to get out ahead of a prolonged crisis of credibility and stem an exodus of its own membership: What can be done to improve the quality of liturgical preaching? The hunger and thirst for the word is there. Bellinger shows in survey after survey. What is needed is mutual awareness and more straight talk between pulpit and pew. 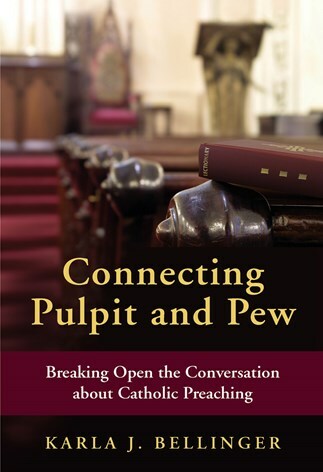 With her passionate desire to connect pulpits with pews, Bellinger opens the dialogue by interviewing countless parishioners young and old and by giving voice as well to Catholic priests and deacons. Doing so she provides the models and sets the pace for what needs to happen to bridge the gap between parishioner and preacher long before they enter their churches. Her academic research, together with her pastoral understanding, contributes well to her suggested directives inviting others to enter the dialogue that may produce Catholic preaching that is truly conversional. Connecting Pulpit and Pew is a new departure in Catholic homiletics: it invites the people in our pews to help us understand what `connects' with them and what does not. The results are unsettling, surprising, illuminating and hopeful. Bellinger affirms that people are listening and preaching matters, because the encounter with God matters. Those of us who preach or care about preaching would do well to listen and learn from this book. A lively read, too! Feel like there is a huge cavernous divide between the pulpit and the pew? If you want to close the gap, this is the book. It's historical and contemporary, it includes quantitative and qualitative research, you hear what preachers want and pew sitters desire. Gather a group of parishioners, share the questions in the back, become a listener who gives feedback and feel the love grow. This is adult faith formation at its finest. When high school students listen to preaching, do they hear a word of life that speaks to them? Does the proclaimed Word reach a generation that is plugged into social media? Karla Bellinger decided to find out. The students' honest replies about what touched their hearts, what challenged them, and what they wish they had heard may surprise you. Anyone who is eager to learn more about how the gospel transforms the lives of younger hearers of the Word, and the role of the preacher in that process, will find rich insight and concrete suggestions in this valuable volume. This book grew out of the author's listening to listeners. They are, after all, the ones who will know whether or not the preaching was good, whether or not a connection between the message the person in the pew was made. . . . This very readable book is well grounded in both knowledge gained from experience and insight into the art of preaching. It should be read by all who want to improve the way they communicate the riches of the word of God. This book effectively engages one of the most frequently discussed topics pertaining to Catholic liturgies-the quality of preaching. Appreciating the significance of the homily, Karla Bellinger offers both critique where improvement is needed and praise for preaching that truly connects with the faithful. Her compelling narrative includes positive examples of outstanding preaching as well as symptoms of disconnection that illustrate her central argument: the necessity of the preacher understanding the world of the hearer. Karla Bellinger's byword is `connection' and her book definitely connects with the serious reader, both preacher and listener. There is nothing more exciting than breaking open the Gospel of Jesus Christ-especially to a congregation engaged in the homily. Connecting Pulpit and Pew not only reinforces this essential mission, but confronts directly "the Loud Silence" that impedes the preacher's effectiveness. We are reminded that preaching matters, that people hunger for an encounter with God, and that the Gospel is most powerful when connected with our lived experiences. Good preaching connects the Sacred Scriptures with the scriptures of people's lives and Karla Bellinger breaks open the underlying passion, message, and methods that make for genuine encounter. Through the lens of young Catholics, Bellinger enables us to re-tool in order to better connect with this generation-and all generations. Bellinger has travelled the nation trying to crack the "loud silence" that exists between Catholic preachers and their parishioners, with a special attentiveness to youth. In this book, she reports her discoveries, but perhaps even more important, she shows us how to continue the conversation in our own communities. The discussion questions posed at the end of the book are - alone - worth the price of the whole. They promise to provoke meaningful conversations at the local level that could substantially bolster the quality of preaching in the U.S. This book grew from the author's national empirical study of Catholic young people who said "Preaching Matters." How to make preaching better is about "connecting." Whether pew-sitter or preacher, read and share this book if you want to open the conversation about how important preaching is to the spiritual life of your community.